You will need Node and npm or Yarn installed on your machine. A basic knowledge of Angular and Node is required. An electronic polling system allows users cast their votes with ease without the hassle and stress of visiting a polling booth. This makes it easily accessible as it can be used by users anywhere in the world. Adding realtime functionality to the application improves the user experience as votes are seen in realtime. Using Angular you can extend the template language with your own components and use a wide array of existing components. We’ll build a realtime polling application using Pusher , Angular and charts.js for data visualization. 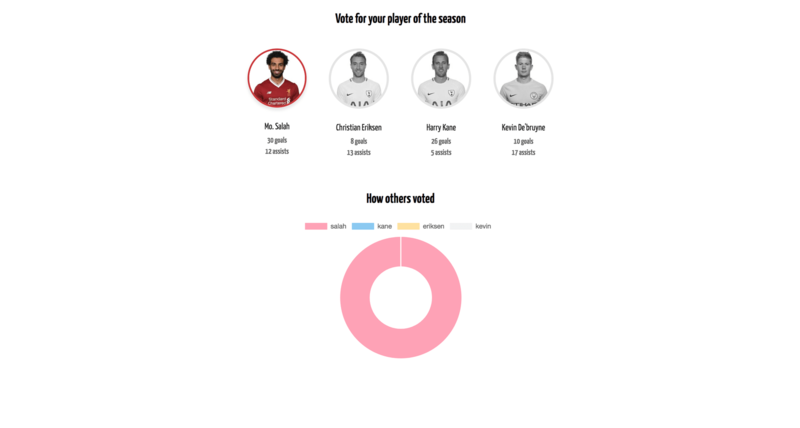 Using our application users will get to vote for their favourite soccer player in the English Premier League. We’ll send our votes to the server and with the help of Pusher, update our polls in realtime. To make use of Pusher you’ll have to create an account here. The command is simply telling the CLI to create a new project called angular-realtime-polling and it should make use of the CSS pre-processor SCSS rather than CSS for styling. Open a terminal inside the project folder and start the application by running ng serve . If you open your browser and visit the link http://localhost:4200 you should see the screenshot below if everything went well. 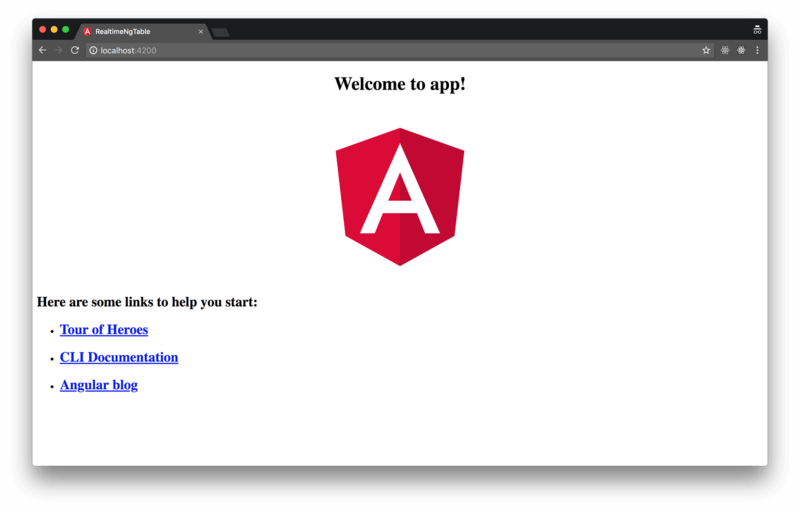 Now that we have our Angular application running, let’s build our server. Run npm install express on a terminal inside the root folder of your project to install Express. We referenced three packages that haven’t been installed, body-parser, pusher and dotenv. Install these packages by running npm i body-parser pusher dotenv in your terminal. The body-parser package is used to parse incoming request bodies in a middleware before your handlers, available under the req.body property. Also you’ll notice that we installed Pusher library as a dependency. Create a Pusher account and a new Pusher Channels app if you haven’t done so yet and get your appId, key and secret. The last package, dotenv is a zero-dependency module that loads environment variables from a .env file into process.env. We use this package so we don’t add sensitive information like our appId and secret directly into our code. To get these values loaded into our environment, we'll create a .env file in the root of our project. Your .env file should look something like the snippet below. We’ll add our Pusher appId, key and secret provided here. If you noticed, I added the dotenv package at the start of our file. This is done because we need to make the variables available throughout the file. Please ensure you replace the following placeholder values above with your Pusher appId, key and secret. To enable users send requests to the server, we’ll create a route to handle incoming requests. Update your server.js file with the code below. We created a POST /vote route which, when hit, triggers a Pusher event. We used object destructuring to get the body of the request and also the player info sent by the user. The trigger is achieved using the trigger method which takes the trigger identifier(vote-channel), an event name (vote), and a payload. Open the app.component.html file and replace it with the content below. In the code snippet above, we looped through playerData to create a view based on the player’s information. There are some undefined variables in code snippet above, don’t panic yet, we’ll define them in our component file below. In the HTML snippet we made reference to some variables that weren’t yet defined, we’ll create the variables here with the logic behind our application. castVote: this method makes use of the native httpClient service to make requests to our server. It sends the name of the player being voted for in a POST request to the server. When a response is returned, it sets the voted property to true signifying that the user has placed a vote. Also, it sets the vote property to the name of the player being voted. getVoteClasses: this method sets classNames on each player element based on if a player was voted for or not. So far we have an application that enables users to cast votes but we have no way of keeping track of how others voted in realtime. We also have no way of visualizing the polling data. To solve both these problems, we’ll include the Pusher library and Chart.js for data visualization. To make both libraries available in our project we’ll add the libraries as third party scripts to be loaded by Angular CLI. All CLI config is stored in .angular-cli.json file. Modify the scripts property to include the link to pusher.min.js. and chart.js files. After updating this file, you’ll need to restart the angular server so that the CLI compiles the new script files we’ve just added. Ensure you replace the PUSHER_KEY string with your actual Pusher key. We’ll make use of this service in our component, by binding to the vote event and incrementing the votes of the voted player returned in the event. This will be done in the ngOnInit lifecycle. Now that our application has been built out, we’ll need to visualize the voting process using charts. This is vital because we need a way to determine the winner of the polls and how each person voted. To make use of charts in our application, we’ll import the ChartsModule into our app.module.ts file. We can then use the canvas component to provide visualization. Make the following changes to your app.component.ts, html and css files. chartLabels: we provide labels for our chart using the keys of the voteCount object. chartData: the chart data will make use of the values of the voteCount object which signifies the vote count of each player. chartType: we specify the chart type we’ll use. We also made a few changes to the ngOnInit lifecycle. We update the chartData values whenever there’s a new vote event. At this point, your application should have realtime updates when votes are placed. Ensure that the server is running alongside the Angular development server. If not, run node server and ng serve in two separate terminals. Both terminals should be opened in the root folder of your project. To test the realtime functionality of the application, open two browsers side-by-side and place votes. You’ll notice that votes placed on one reflect on the other browser. Using Pusher, we’ve built out an application using the pub/sub pattern without having to set up a WebSocket server. This shows how powerful Pusher is and how easy it is to set up. You can find the demo for this article on Github.